Last week I became the matriarch, the eldest in my family. My mother passed quietly in her sleep after fifteen years and more of excruciating pain, pain liberally shared with family members. In our grief, we’re also relieved to have that suffering at an end. She and I didn’t get along. She favored her sons, feared her daughters, and did her best to keep us apart so we wouldn’t gang up on her. But when she died last week, in spite of a lifetime of intermittent estrangement, I found myself honoring the good in her rather than enumerating my mother’s sins, to the surprise of friends who have heard my tales. In my own life, I’ve tried to distill her good qualities and leave out the bad ones. Yeah, she admitted to being a crappy mother – but she was a terrific organizer. I’m a great mom and organizer. She found much joy in music in her youth but gave it up because my dad didn’t like it, whereas I divorced my first husband (who didn’t like me practicing fiddle around the house) and kept right on playing. She put aside dreams of music as livelihood; I followed through on mine. Our mother was fierce in her support for our veterans. Both she and my father served in World War II, my brother was a career Navy man and I wore an Army uniform in the sixties. I have inherited Mom’s zeal for making sure the men and women who volunteer are treated well when they return. I may loathe the politicians and their politics that started the wars but I respect and honor the veterans. I am reminded of this more often now as I receive medical treatment at the VA. The woman stood up for herself and I by learned by example. 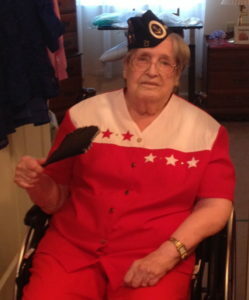 Instead of joining the American Legion Auxiliary with the other wives, my mother joined the Post with the men. In the 1950s. 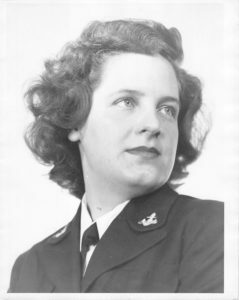 She’d served in the Navy, she was eligible and she was damn well going to join the Post. She ran for and held local and state office with them in the 1960s, even though the men whined about not wanting “a skirt” in that job. Mom was a passionate community volunteer and being the eldest, I was drafted into helping. There were poppy sales in May. We canvassed the neighborhood for the Heart Fund, the Cancer Society, the March of Dimes. Community service was important in her life. She’d grown up poor, known hunger. Lack of health care had shortened both her parents’ lives. A lifelong Democrat, she felt responsible for helping those in need, a teaching that still informs my politics. Unable to take ‘no’ for an answer and insatiably curious, my mother would have made an excellent lawyer, police detective or labor negotiator. Instead she turned it on us. But then, I learned to dicker from one of the best. Too bad that skill was undermined by her inability to filter her comments, which often fell out of her mouth without regard to their effect. Oh Mom, am I ever your daughter! Truth is, I’ve worked out most of it – who I am, who she is and was. A life creating music, years of therapy, writing a memoir, parenting a daughter to adulthood and remaining close friends with her – these have done much to heal the scars of childhood. So if I hold my mother in judgement for her sins, I hold myself in victimhood along with her. That’s a pattern that she carried all her life, one I prefer to release with her passing. I don’t want to tether her here with my judgement. She’s moved on. In the last week of her life, I called her twice and both times she rang off after a minute or so. She’d already made her amends and I know that wasn’t easy. So let her spirit move on to whatever comes next, free of my daughter-ness, my unmet needs, my unresolved anger, my missed opportunities, my judgement. She doesn’t owe me anything. Every time I moved to a new place, I tried to to renovate my psyche. I used the change to reparent myself, to let go of things I didn’t like, to learn new and more functional behaviors. So I continue remaking myself a day at a time now that she’s gone. No longer a daughter, I remain a mother and become a matriarch, even though my birth family remains a difficult landscape to maneuver. De mortuis nil nisi bonum – speak no ill of the dead. Not out of fear of being haunted, but because after they leave us, we need to release the negativity of our shared past, forgive their sins, free ourselves from those unhappy roles and the obligations of relationship. Still, because of her, I am so lucky to be able to turn my grief into art. That’s her biggest gift to me, one I just couldn’t do without. How could I say anything else but: Thanks, Mom!